Venue: Galway Social Space, 24 Middle St. Present: Shane, Tiernan, Indy, Mairéad, Catherine, Robert, Stan. Note: The prominence and proximity of National Bike Week (14–21 June 2009) means that it has been given priority over other items, which are either discussed in the context of Bike Week or not discussed at this meeting, with one exception (see (1) below). 1. The Irish government launched its National Cycle Policy Framework some weeks ago. Those at the meeting who had read it or looked through it agreed that it was an impressive and aspirational document, but that it had obvious drawbacks: it contains no figures, no dates, and no deadlines. Whether good intentions can be turned into policy and practice is a big unknown, but the document’s publication is definitely a positive step by the government towards genuine promotion of cycling. Some of the aims described in the document were mentioned and discussed. 2. Ireland’s first ever Bike Week takes place from 14 to 21 June. 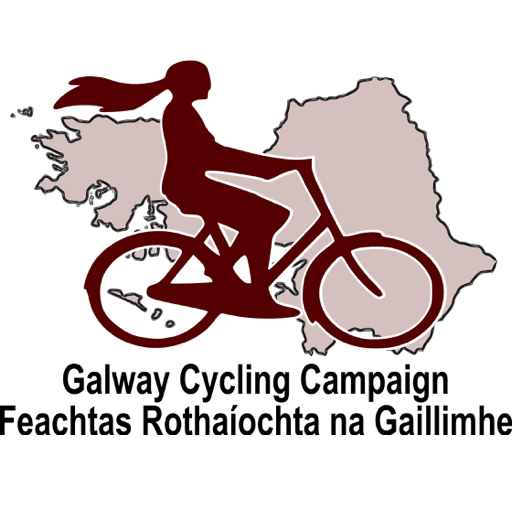 The Galway Cycling Campaign does not have much time or resources to prepare for it, but is nonetheless determined to do as much as possible for it. Shane and other representatives have been in contact with the City Council and other bodies, but the Volvo Ocean Race has taken centre stage for a while. A comparison with Dublin is instructive, not just in terms of organisational power: Phoenix Park is to be closed to traffic, an event management company has been hired, and a cycling officer has been preparing for Bike Week for months. Our financial and personal resources are more modest. Tiernan of Green Schools said that the Green Flag has moved on to Travel, so there is now more of an emphasis on cycling and other alternative forms of transport. Cycle parking is to be launched in several schools, and projects such as Cycling On Wednesday (COW) and Beauty and the Bike are also being pushed. He acknowledged that the fear factor – the perception of road danger – was a considerable obstacle for some parents (more on this below). Robert asked whether any teachers were championing cycling. Wednesday of Bike Week is “Bike to Work” day. Shane pointed out that for many people this is not something that can be decided on or prepared for on a whim, or even a few days beforehand – there needs to be an information campaign, ideally to include the local media, with a few weeks’ lead-in to give potential participants time to get their bikes checked for safety and roadworthiness. Some cyclists might not have cycled for some weeks, months or even years, and will need time to practise basic skills off- and on-road. The Galway Cycling Map project is coming along well. Stan and Shane gave a quick summary, mentioning the online version being plotted with Google Maps but focusing on the physical maps. Galway City and several county towns have had their streets colour coded as per Warrington’s scheme. Shane and Oisín have sourced map plans and have entered and organised as much data as possible. Some town maps, e.g. Tuam, need local input. Stan has written text for the maps, some of it adapted from the Galway Cycling Campaign’s popular “Share the Road” leaflets. Sunday 21 June concludes Bike Week, and the Galway Cycling Campaign is hoping to have a family treasure hunt that afternoon. A mostly off-road route has been planned, from Dangan through the university, down the canal, out by the Claddagh and South Park as far as Mutton Island. This event was discussed in detail by all at the meeting, since there was a lot to consider and not a lot of time to prepare. Mairéad asked if this kind of event had been done before. Shane said it hadn’t – at least not in Galway; Tiernan said that something similar had been done in Cork. Apparently Patrick St. was closed off for it. Catherine suggested having refreshments on offer, especially for the children taking part. This was an excellent idea that hadn’t yet come up. Tiernan spoke of a cyclist with a smoothie-making bike; he also suggested balloons and face painting. All such ideas were enthusiastically received, as they would contribute to the fun and festival feel of the event. Prizes were discussed – different prizes would be needed for different ages. Children under a certain age would need to be accompanied by a parent or adult. But what age? A code of conduct was proposed, to be signed at registration, containing instructions such as “No racing”, “Yield to pedestrians”, etc. Catherine asked if we had permission from NUIG, liability insurance, etc. Shane said that we needed feedback from NUIG about this as soon as possible, and suggested that Catherine, Mairéad and Indy form a subcommittee to tick the NUIG boxes. Indy thought of someone she could ask about some of these matters. Indy also pointed out that there were tricky parts on the route, such as a narrow pass between rocks along Dangan. Catherine asked whether there was or would be a special map for the treasure hunt. Catherine said that we should have bikes for people who don’t have bikes, or don’t have usable bikes, or would have difficulty bringing bikes to the event. This was immediately agreed on, and provoked some discussion. Bikes to be used on the day would need to be ordered in advance if possible. Catherine also asked about funding. Shane said that there was national funding, but that locally it was unclear. Financial support from the Council was unpredictable, as last year’s Mobility Week showed. A list of potential volunteers needs to be drawn up, and an ad hoc media blitz should be done, to include Galway Bay FM, posters, emails, local press and so on. Catherine volunteered to approach GBFM, and there was some discussion about what a daily 2-minute slot could include. A different skill subject each day, for example, or local tips and routes. Robert suggested that a willing radio employee could cycle for a week and report on air each day, hopefully with positive progress regarding his/her skill level and experience on the road. Tiernan concurred, adding that when parents began walking their children to school their first reaction was of fear or apprehension, projected from their in-car perception of traffic danger, but that they soon came to love the walking experience. Tiernan added that the Green Schools could spread the word through participating schools. It’s obvious that we need volunteers – as many as possible – to help out on the day, as well as official support. Robert said that a competitive approach could help, especially to get businesses involved. Shane agreed but said that time and resources might preclude this. Shane said that he would set up an email list for everyone involved in Bike Week. Apologies: Oisín, Simon, Kristin, Urs. Shane read the minutes from the January meeting. Stan proposed them, Shane seconded them (since no-one else was at both the last meeting and the present one), and they were duly adopted. 1. Oisín and Simon had a meeting on 5 February with the City Council Transportation Unit and Tobin Engineers regarding the Seamus Quirke/Bishop O’Donnell Road redevelopment. Tobin Engineers were represented by Tom Cannon and Eddie McGuire, while the Transportation Unit was represented by Martin McElligot (Senior Engineer), Lisa Kealy, and Brian Burke (formerly of Tobin Engineers). Via email Oisín reported that the meeting went well, that he and Simon outlined their concerns and received some clarifications arising from their detailed analysis of the scheme. Their suggestions were listened to, and solutions or compromises were sought where possible, though some problems remain. There was a detailed discussion of the proposed redevelopment schemes using large printouts that Shane had brought. Indy and Eoin analysed the Moneenageisha plans in some detail, since they both use the junction on a regular basis. 2. A HSE staff travel survey reports that 34% live within 5km of work. The breakdown of travel mode is as follows: 3% cycle to work, 8% walk, 3% take a bus, 6% drive with others, and 80% drive on their own. Shane phoned Laura McHugh and Jacky Jones of the HSE to explain his concerns about the survey type, its results and their implications. Stan said he had started work on a cycling survey for Galway, to be disseminated widely upon completion and used as an ongoing source of data and insight. 3. National issues. The Government’s recent Smarter Travel document was discussed. It aims to prioritise cycling and walking, but there’s a big difference between aspirational talk and progressive action. Galway has been mentioned as a possible site for pilot schemes. Discussion followed about whether and how the Galway Cycling Campaign should respond. Stan said he would compose a ‘cautiously optimistic’ press release. Shane is to give a presentation to the NRA next Thursday, 12 February. A meeting with the NRA will then follow, in which Shane and other Cyclist.ie representatives will discuss staff training, infrastructure design, village gateway schemes, hard shoulders, speed limits, and so on. Eoin showed the group his brother’s M.A. thesis, an economic evaluation of cycling policy. It looked very interesting but there was no time to study it in any detail. 4. Shane met representatives of the Green Schools initiative; they discussed insurance, training, etc. In a related matter, the West Coast Wheelers contacted Shane to enquire about training skills. 5. Shane and Oisín joined in the last Critical Mass cycle, and Shane gave a brief report. The weather was awful, but about 18 attended anyway. The group cycled around the town centre and avoided dual carriageways. There was some deliberate car-blocking, a tactic many cyclists consider counterproductive. 6. In Urs’ absence his report on cycling policy in Switzerland was postponed. 7. Shane described the prospective Galway cycling map, including its colour code and other salient features, which are to be based on Cheltenham’s cycling map. Partial funding has been confirmed, which Simon can report on at a later date. Stan reported on a meeting he and Shane held with Dr Valerie Ledwith and Dr Frances Fahy in the Geography department, NUI, Galway. It was a very helpful and constructive meeting, and gave us considerable insight into various aspects of the project by comparing it with the successful Galway Green Map. A meeting is planned with relevant members of the City Council. 8. The Volvo Race is looming, and is being pushed heavily by the local media, but from our point of view resources are limited and we might not be able to capitalise on the event. 9. Eoin attended a talk by Green Party TD John Gormley. He said that the apparent futility of public consultation was a big issue among the attendees. Stan passed round a copy of the Galway Advertiser with a GCC press release and photo of the canal path resurfacing – a positive piece for all concerned. Present: Shane, Oisín, Conor, Urs, Stan. Apologies: Simon, Indy, Kristin, James, Eoin, Martin, Alan. Minutes were read from the GCC meetings in October and November 2008. Matters arising: Shane called the RSA re HGV stickers handed this task over to Adam in Cork. The minutes were proposed, seconded and adopted. Brief introductions were made, there was some informal chat, then Shane asked the first-time attendees what they would like to see out of the GCC. Both Conor and Urs cited practical measures – something hands-on and effective to improve conditions for cyclists in Galway. 1. Oisín met Martin McElligot from the Transportation Unit, who offered to meet every few months. Shane mentioned the current work on the Ballybrit roundabout, where a hole in a wall by the bus stop would greatly convenience pedestrians and anyone getting off the bus at that stop – this would be a low-hassle, easy-win measure. Urs asked about planning in Galway. Stan mentioned the City Development Plan, that its modest demands are there in writing more than in reality. Oisín and Shane elaborated on this and on the transportation studies. There seems to be little or no real enthusiasm in city management for public transport, still less for walking and cycling. Oisín referred to the bus lane earmarked for the Seamus Quirke Road since 2003. The plan is apparently being sat on. 2. There followed a discussion about the Volvo Race, the cycling map project and local politics. One idea that arose for discussion was the possible conversion of selected one-way streets to two-way for cyclists. Shane proposed to make a list and pick the one-way streets that could be converted with minimal cost and engineering requirements, and maximal benefits to cyclists. Conor suggested that this could be integrated with the map project. The suggestion was well received, though it was acknowledged that much would depend on resources, timing, circumstances and other unknown variables. Urs asked about lobbying tactics, and how changes are best effected. Oisín explained how the Renmore Road redevelopment signalled a better process of communication between the GCC and the consulting engineers. The engineers approached the GCC and took its ideas on board before finishing the design plan, resulting in a creditable final design. 3. Shane gave a brief report on Cyclist.ie, the new national cycling lobby group. Urs compared Ireland’s cycling situation with that of his native Switzerland. After years of active lobbying there are now five cycling routes across the country, as well as training in schools. Registration and insurance were set through the Ministry of Transport. There followed some discussion about attitudes to cycling and cyclists, the importance of visibility and lights (and Ireland’s legal shortcomings in this matter) and the problem of planning. The national cycling strategy is set for publication, and what its final version will contain and propose is anyone’s guess. We may need to prepare a comment for a national press release, outlining what we expect to see in the publication to best promote cycling in Ireland. Cyclist.ie should also seek another meeting with Ministers Noel Dempsey and John Gormley, to call for enforcement of speed limits, and (on-road?) cycle training for all schoolchildren. 4. Oisín and Shane received cycle instructor training in Manchester and London, respectively, which qualifies them to train cyclists to the UK national standard. There is to be a follow-up over the coming months, to complete the qualification. Getting insurance may be a sticking point and therefore needs to be assessed. It’s £60 a year in the UK. Their training standard depends heavily on safe mechanics – checking everything on the bike before entering traffic. Oisín said he was eager to start training: it would involve more cycling and positive activity – not the usual relentless politics and bureaucracy. Shane explained that some non-national roads require a safety audit from the points of view of various road user types, but that assessors are generally ignorant of a cyclist’s perspective. Maybe we could call for engineers to receive cycle training. 5. Oisín will contact Chris Coughlan and Simon to follow up on the Chamber of Commerce transport initiative. 6. The canal path from Dominick Street to University Road has been resurfaced where necessary and looks very well. The new surface is smooth and light-coloured, which increases safety and visibility. Stan has taken photos and is preparing a press release to thank those concerned. 7. At Oisín’s meeting with Martin McElligot of the Transportation Unit, Mr McElligot said that the Moneenageisha roundabout on the Dublin Road was to be removed as part of the Volvo Race city centre action plan. 8. Alan told Shane that the website needed to change hosts, and that the email archive was liable to disappear. Since several of us archive these emails personally, this was considered acceptable. 9. See also 2., above. Simon received €500 from Galway County Council towards the map project. Licensing and copyright issues need to be investigated. We also need to examine our graphic design resources – can we do it ourselves, do we know someone who can help us, or will we need to budget for design? 10. Urs described the cycle training he carries out with children in Ballybane. He is insured by Foróige and has good relations with the local community guard. In Switzerland there are “traffic parks” where school children are trained to cycle. Oisín said there was one in Dublin. It was agreed that they should be fairly straightforward to assemble – a bit of paint and a few props – once the logistics and location were satisfactorily established. Urs offered to assemble relevant information on the Swiss training and legal environments. Minutes of the previous meeting are to be read at the next meeting. Due to the absence of almost everyone, much of this meeting was comprised of informal discussion. 1. Cycling promotion measures for the Volvo Race can be divided into marketing/PR and infrastructural/traffic-management. Guides, maps and routes for cyclists fall under the former, with the maps idea particularly attractive. The latter includes such measures as access to and from the docks by bicycle, conversion of one-way streets to two-way for cyclists. Promote exploration of the city by bike: by removing obstacles, increasing bicycle parking facilities, and increasing safety and convenience of cycling by the usual means. 2. Two print publications were discussed and analysed: the press release in The Sentinel about Cyclist.ie, and John Cunningham’s opinion piece in the City Tribune. The Sentinel gave generous space to a very good and positive piece, while Mr Cunningham’s article was more of a mixed bag, with some fair points but also some mistaken assumptions and misleading conclusions. Simon said he would write a reply, time allowing. 3. Maynooth Cycling Campaign joined the collective. The most recent subject under discussion by Cyclist.ie was ‘operation freeflow’ in Dublin. 4. A representative of the local Green Party asked Simon if he would be interested in giving a presentation to the Party on 12 January on the subject of 30kph zones. There is widespread resistance to 30kph zones in urban areas. Very few drivers obey the 50kph zones in Galway city, for example, and would likely baulk at the idea of further restrictions on their speed. Nonetheless, 30kph restrictions have been successfully implemented in various towns in the UK. Simon reminded Niall O’Brolchain TD of the Green Party’s policy on 30kph zones. From the Galway Cycling Campaign’s point of view, association with any political party is to be handled with caution. Marty wondered if it would be possible to give such a presentation to all the political parties, and Simon added the possibility of giving the presentation to the City Council. 5. Oisín and Bart met Ministers Eamon O’Cuiv and Frank Fahey to discuss the parking levy; the meeting was more of a general discussion about cycling promotion and traffic conditions. 6. Simon contacted a local sergeant to enquire about repeating the bike lights initiative. There was no response. We received 100 armbands from the County Council. The Road Safety Authority, Anchor Safety (Ballybrit) and Super Valu shared a high-visibility vest promotion. Simon contacted Anchor Safety, who said they would be amenable to a joint project with the Galway Cycling Campaign. Minutes of the previous meeting will be read at the next meeting. Since there were a few new faces, Stan suggested a very brief overview of the group’s activities, which Shane duly supplied. 1. Shane gave a quick recap of Mobility Week, and also delivered some good news: he received a letter confirming funding for John Franklin’s visit to Galway. For a while it had seemed that this would not be forthcoming, so it was gratifying to see that we had not been led astray. It is to be hoped that the City Council will put more planning and effort into Mobility Week next year, in keeping with the County Council and our European neighbours – it is a huge event in many countries, with people actively persuaded to use alternatives to private motor transport. 2. Critical Mass came up for discussion several times, partly because of the successful local event at Halloween. Shane gave a quick report of the event – its route, ambience, and reception from other road users. Kristin clarified where the GCC’s ethos differs from Critical Mass’s, and where they coincide. There was some discussion about the movement’s history, how it differs from place to place, and how its reputation varies among the public and authorities in different cities. This led to some chat about different cycling cultures in places like Denmark and Lithuania, how the law protects cyclists in Germany, and the difficulty of importing infrastructure into a country (like Ireland) that does not train motorists on how to deal with cyclists. 3. Shane met with Galway’s recently developed Transportation Unit, and delivered a presentation on cycling to some of its members (engineers and administration staff). The venue had no internet so Shane couldn’t access the national policy document. He stressed the need for proper bike parking, adding that all sorts of street furniture could be adapted as bike parking. He also spoke about safety issues, cycling lanes, 30kph zones, the Doughiska Road fiasco, and the basics of cycling safety. Regarding safe cycling for children, he advocated ‘nursery’ areas that connect back roads for school routes, and pointed out that closing alleys to cyclists was not a good idea. Marty asked about the Transportation Unit’s brief, its position in Galway’s political structure. 4. Cyclist.ie, the new national cycling lobby group, was officially launched. It was agreed that a press release should be sent to the local media. 5. Shane sent a news story to some of the local media on the Dublin Road development in Renmore. It was printed in the City Tribune. 6. Stan cited last year’s PR on the importance of using bike lights and reflective gear for visibility, and suggested sending another one, given the time of year. Shane told the new faces about our joint safety initiative with the Gardai. Simon said he’d like to redo the safety initiative; all were in favour but this will require more reflective gear to give away. 7. AOB. Kristin was approached by the Young Greens, who are looking for covered bicycle parking. This was generally considered a good idea and an overdue provision. Shane met Tiernan of An Taisce’s Green-Schools programme. They talked about lanes, various cycling promotion schemes, e.g. selecting a school, carrying out a survey, identifying cycling routes to school. Apparently there is funding for parking, and the present focus is on secondary schools. Kristin suggested a cycle-to-school event in the spring. There was some discussion about the benefits of receiving UK certified training. It would give cyclists (like ourselves) more authority when talking to engineers, e.g. when explaining a cyclist’s point of view on a proposed road design, since most engineers do not cycle their own designs. Simon wrote to several officials, in a personal capacity, to see what they thought about the traffic light problem – i.e. that Galway’s traffic lights do not respond to cyclists (he included a photo from Lough Atalia illustrating the problem). He read out their replies. Apparently the city now has 18 signalised junctions. The meeting was declared over, and a donation was collected for Galway Social Space, who are a pleasure to deal with (and who were kind enough to bring us tea during the meeting). 1. Mobility Week was considered a great opportunity to encourage cycling and to inform people about alternative modes of transportation. Given the high proportion of single-occupant car journeys in Galway and nationwide, every convert to cycling will have a positive effect on the state of traffic. Shane gave a seminar in NUI, Galway entitled “Tips and Tricks for Bicycle Users in City Traffic”. It was well-attended and provoked some interesting discussion. John Franklin, the renowned cycling advocate and road safety educator, launched the second edition of his book Cyclecraft in the City Library on September 16. Among the attendees were Chris Coughlan of the Galway Chamber, City Councillor Catherine Connolly, and members of the Galway Cycling Campaign and general public. John gave a talk, followed by a Q&A session. At the monthly meeting it was quickly agreed to send thank-you cards to John and the Library, as well as to Sarah Knight and the City Museum for the parts they played during Mobility Week. Sarah did great work promoting Shane’s presentation in NUI, Galway, and the Museum were courteous and helpful in granting us space for presentations by Shane and Oisín on September 17. Kristin agreed to follow up on this. Bart gave two bike maintenance workshops during Mobility Week, one in the university and one in Eyre Square. The Eyre Square workshop was combined with a folding bike demo in a marquee organised by the City Council. We also handed out road safety leaflets and bike lights, and we have more of these for the next time. Although the location wasn’t ideal for passing cyclists, Bart was kept busy and the sunshine helped make it a successful and enjoyable afternoon. Other Mobility Week news: Shane spoke with a member of the Tuam Chamber of Commerce on the subject of one-way streets, specifically the possibility of making them two-way for cyclists in the town. John Franklin met with members of the City Council, the County Council, and the RSA in Ballina. John helped design the UK standard safety course, so his ideas and expertise received interest and appreciation in all quarters. For example, cycle training in Ireland is traditionally off-road, but this doesn’t prepare children and learner cyclists for traffic; John’s system allows them to progress towards traffic situations of growing complexity. Oisín proposed writing to the Road Safety Authority (RSA) to follow up on their meeting with John Franklin. Shane said that ideally we would be having regular meetings with these bodies, especially the County Council. County councils nationwide are putting together development plans, and we need to be involved. Engineers and planners in the county seem to be quite open to new ideas, especially since Mobility Week. 2. The signs project with the County Council (“Burn fat not oil”; “Commuter not polluter”) is progressing nicely – the signs are completed and are big, clear and durable, sure to catch the public’s eye in their destined towns. Meanwhile, Shane and Oisín are seeking funds to replace the damaged signs in the city. Regarding the city signs, Kristin felt that the text was too small and might warrant a redesign, e.g. with a landscape layout rather than portrait. This would make them slightly more hazardous, but some kind of redesign was not ruled out. 3. Oisín went to the Doughiska Road residents association meeting, and he and Indy both attended the launch, where Oisín conveyed the Galway Cycling Campaign’s problems with the scheme. Oisín and Shane had a meeting with Minister Eamon Ó’Cuív, Joe Tansey, Ciaran Hayes, Mary Leahy and Michael Crowe. Shane and Oisín explained how the redevelopment design would endanger cyclists and pedestrians alike. Minister Ó’Cuív showed very good knowledge of the issues being discussed, backing the Galway Cycling Campaign’s positions and challenging Mr Hayes. The latter, unfortunately, was not budging, though he may consider minor changes. Joe Tansey said that the best way to make roads safer for cyclists was to have more cyclists on the roads; maybe John Franklin’s wisdom is finally spreading to officials. Shane launched a legal complaint against the lead engineer on the Doughiska Road Safety Audit. This audit is considered a farce, with 12 of its 15 comments partly or totally about cycling, but without any understanding of cyclists’ concerns or needs on the road. And there was little or nothing about pedestrians, bus users or motorised vehicle users. The proposed signs for the road are the mixed-use pedestrian/bicycle signs, and under Irish law compulsory use rests on “cycle track” signs. At the meeting with the Minister, councillors and city officials, Shane was challenged about the legal action, and he pointed out that he would much rather not have to go through the ordeal, and that a little consultation early on would save a lot of people a lot of bother. As Oisín put it, the cycling group members would much rather be out promoting cycling. There was also some discussion about what cyclists we represented, and about the need to address cycling in the context of sustainable transport. In any event the Doughiska Road redevelopment scheme is to go ahead and will soon begin. 4. There was some discussion about the cycling maps for Galway, e.g. who they could benefit, what symbols we could use to denote what facilities, and where funding was being sought. 5. Shane and Stan gave a quick update on the national group (Cyclist.ie) – basically, things are progressing fine, a couple of press releases are being prepared, and the consensus policy paper is being distributed to various authorities. The RSA approached us for ideas on a draft warning sticker to be placed on the back of heavy goods vehicles. Stan had some problems with the basic layout, while Adam from the Cork group contributed his own design, but the important thing is that we were consulted in good faith and will respond in kind. The sticker needs to get the message of danger across as quickly and unambiguously as possible, with little or no English required to interpret this message. 6. Press and public relations. Kristin suggested a press release on the economic benefits of cycling, which would be a timely push given the current economic climate. The cost of fuel is very high, something City Bus have made use of in their ads. For families with two or more cars, motorised transport costs are likely to keep rising. Stan added that the cost and hassle of parking would continue to affect motorists – another angle for encouraging more cycling. Indy mentioned Greg Power at the university Buildings Office: another possible source for collaboration. The bike lights initiative with the Guards was discussed, and all meeting attendees agreed that it would be worth doing again. We should try to get more armbands and reflective vests. According to Indy, the reflective jackets project in the university is still ongoing. Kristin said that the timing was right because of the dark evenings. Indy remembered Simon’s press release last year calling for cyclists to be well lit at night – time for a similar call, perhaps. Indy asked about overtaking on the left. Stan said that as far as he knew, if was a legal grey area. Shane affirmed this and expanded on the subject. Indy had been knocked off her bicycle twice in recent months, and wanted to establish where the responsibility lay, so she recounted the incidents and we discussed them. Oisín reported receiving verbal abuse from a van driver (“Get off the road!”). It was recommended to report all such incidents to the Gardai. 7. AOB. Simon proposed the idea of a leaflet for new members, to introduce them to the group and its basic aims. Stan suggested including the Hierarchy of Provision as described in the national document. Shane met with Jeremy Franco to discuss cycling provisions during next year’s Yacht race stopover in Galway. Jeremy wants to push cycling, and Shane advised him on how to approach it. Simon suggested a yearly work plan to help plan for major events such as Mobility Week and Road Safety Week. The latter was announced quite suddenly and the cycling advocacy community were not exactly inundated with invitations. Eoin is looking into Irish Rail matters and will report back. There was some discussion about how to distribute material, online and offline. A wiki might be a good way to do it, and it’s something we’ve touched on before. The idea of business cards for the Galway Cycling Campaign was put forward and roundly supported. Stan said he’d look into free services online.